Fashion repeats itself; bygone historical trends evolve as new fashions. Tattoo designs which were popular forms of body art in ancient times are gaining popularity today. There are the calligraphy tattoos, the geometric designs, the floral patterns, the abstract designs, and many other types. Geometric tattoos come in all different sizes and shapes and can be breathtakingly beautiful, mysteriously scared, or flawlessly gorgeous. Have a look at our awesome collection of geometric tattoos to get some inspiration for your next design project. 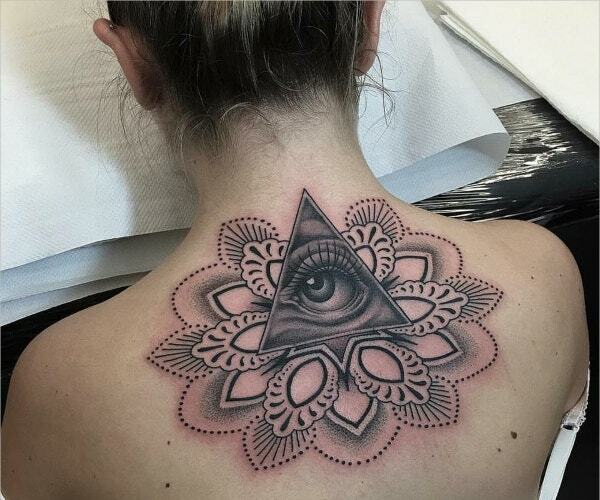 This geometric eye tattoo is on the back of a woman’s neck. 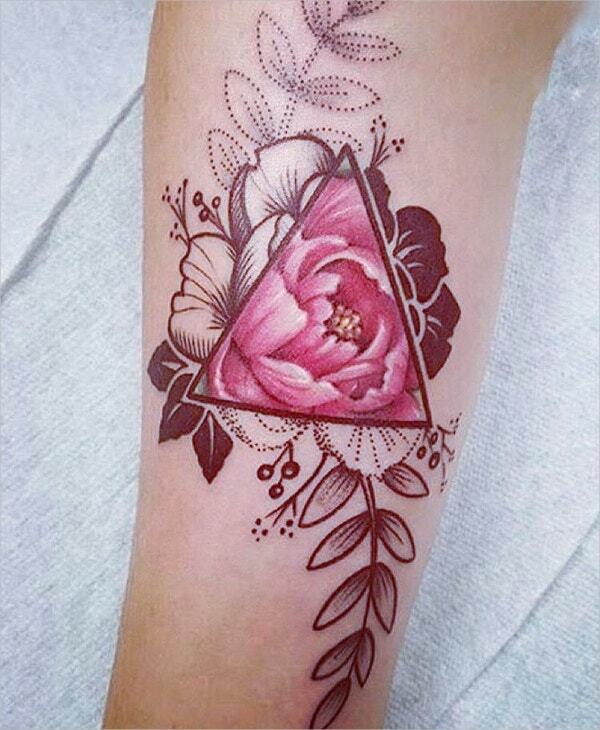 The human eye is so keenly drawn in a triangle situated amidst a Floral Pattern. 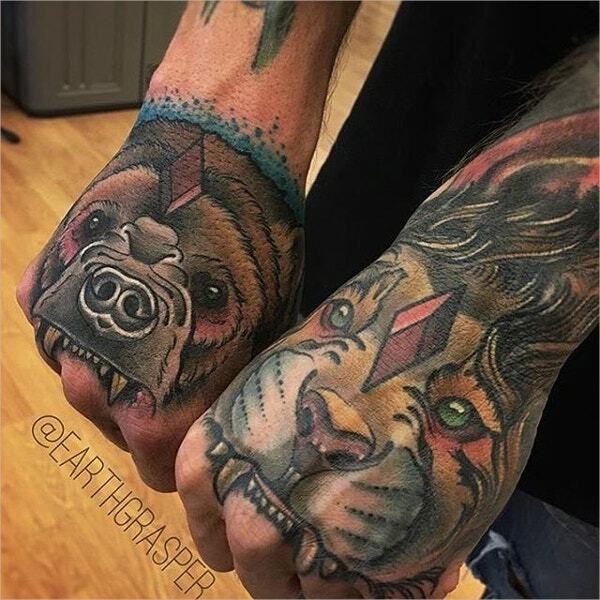 Here are two colored tattoos of the faces of a tiger and its cub. It is very carefully done on the two fists and forearms of a man. 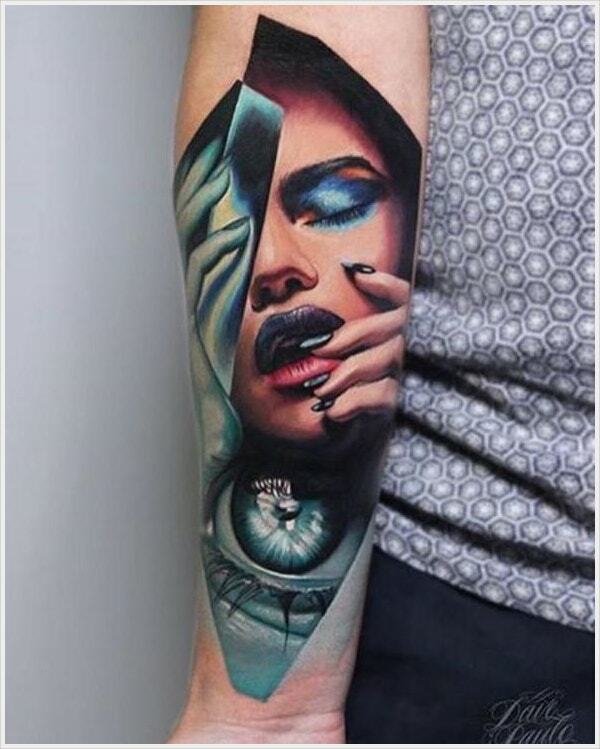 This is a realistic hand tattoo of a girl’s face half of which is in light and the other half in darkness. Below the girl’s face is the image of a human eye. 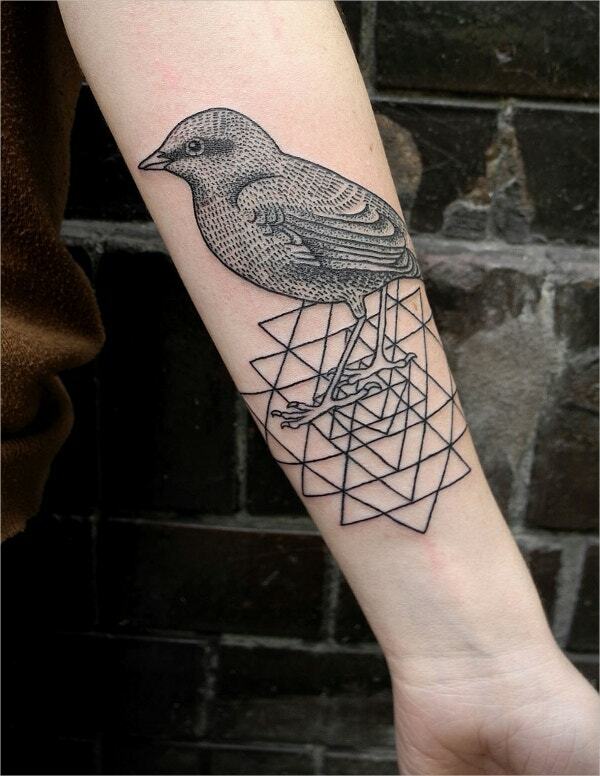 This is an elegant Geometric Pattern tattoo on hands. It is colored with different colors. It looks great against fair skin. This minutely detailed geometric floral pattern on a woman’s thigh looks beautiful. It is in black and gray and seems to stands out of her skin. 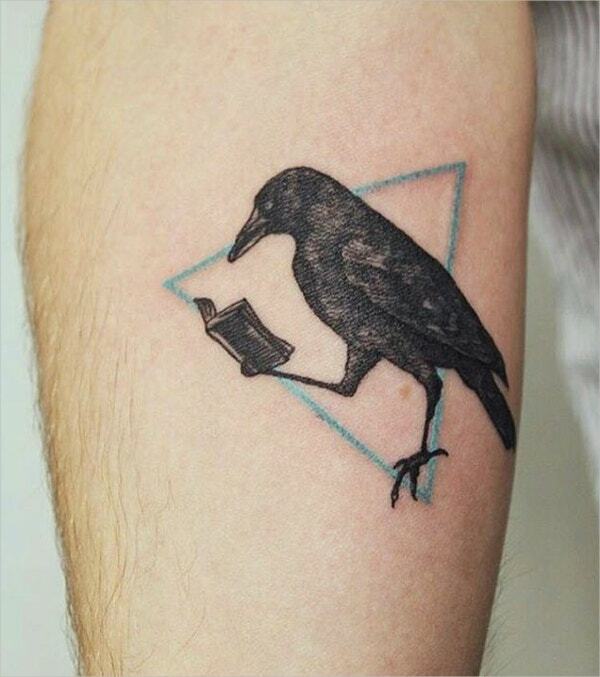 This is a funny geometric tattoo of a crow holding and reading a book. The crow image is present inside an outlined blue colored triangle. 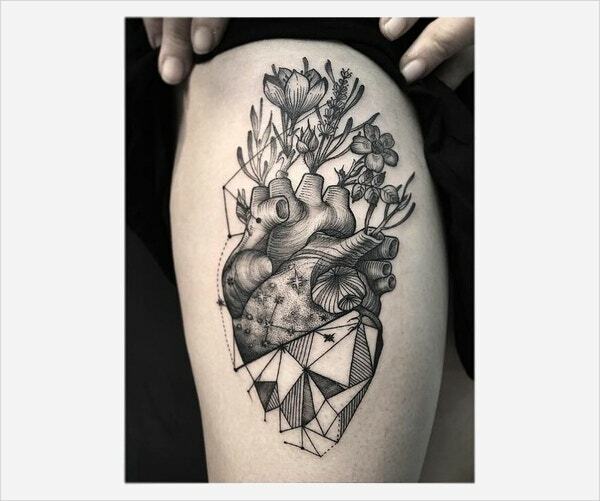 This is an abstract geometric pattern tattoo of a human medical heart. The aorta, arteries, and veins to the heart are acting as vases to hold beautiful flowers. 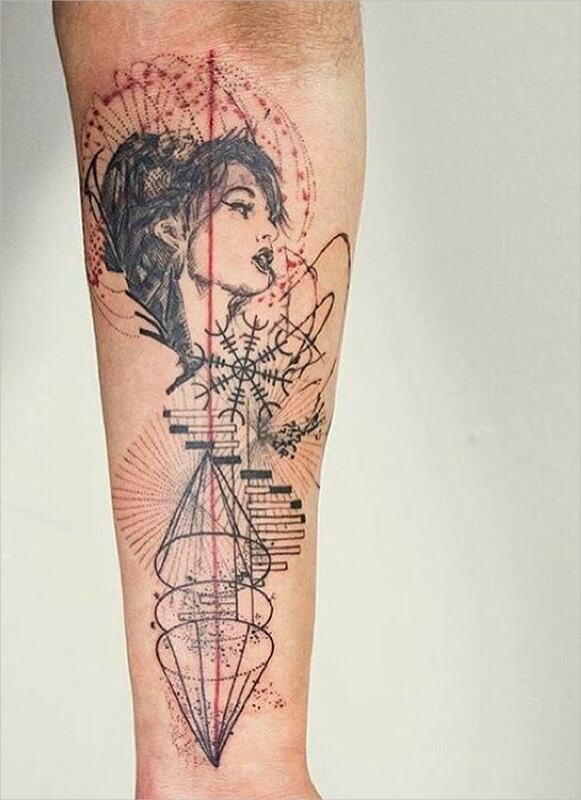 This is a unique inspirational geometric tattoo in black and red. It holds a beautiful girl’s face, swirling steps, cones, lines, etc. 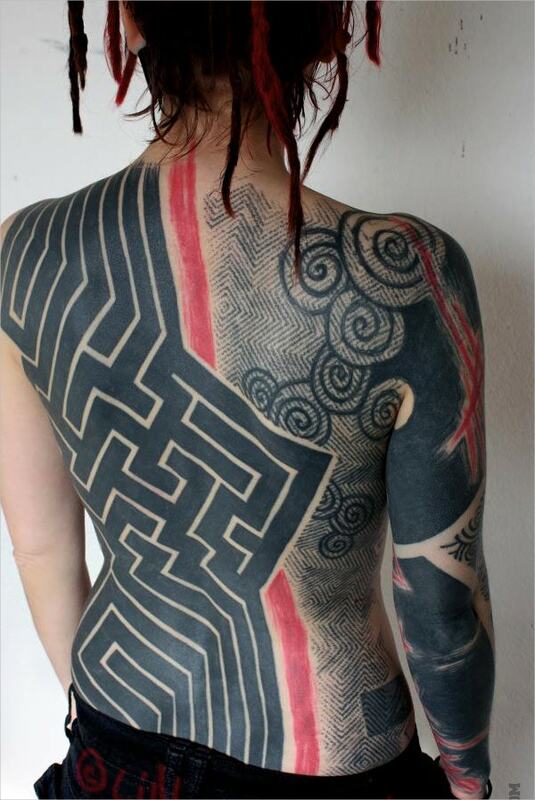 This is a detailed abstract geometric pattern which covers the entire back of a woman. A part of the tattoo is also present on one of her elbows. 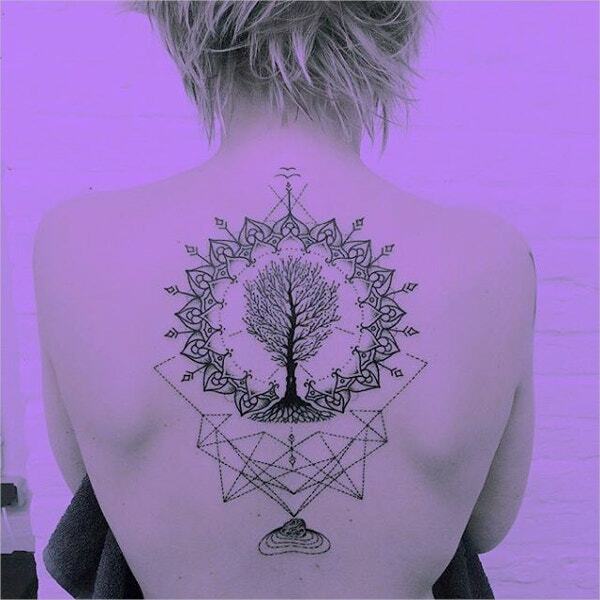 This is an inspirational geometric tattoo on the back of a woman. It has the image of a tree from where some inspirational rays are radiating. 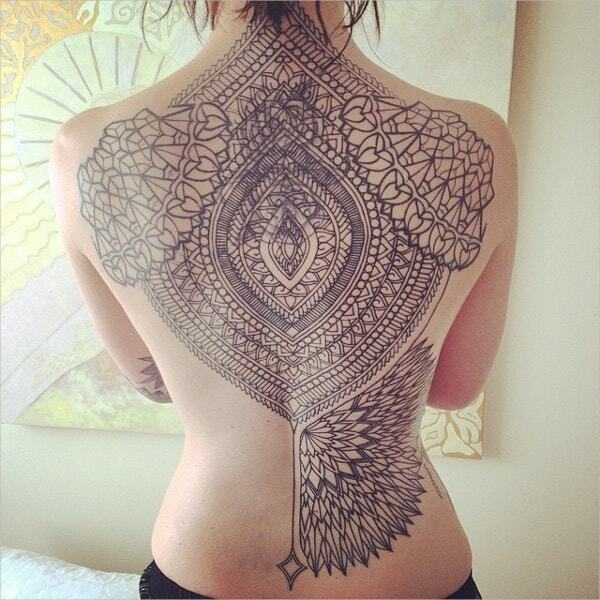 This is an elegant looking geometric pattern tattoo on the back of the arms, fingers and fists of a woman. It resembles some tribal pattern. 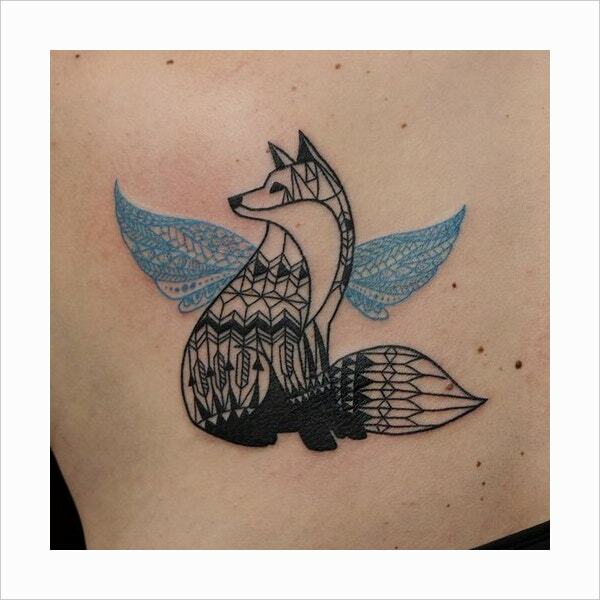 This geometric tattoo of a winged wolf in blue and black seems to stand out from the skin. The wolf’s body and its wings are filled with linear geometric shapes. 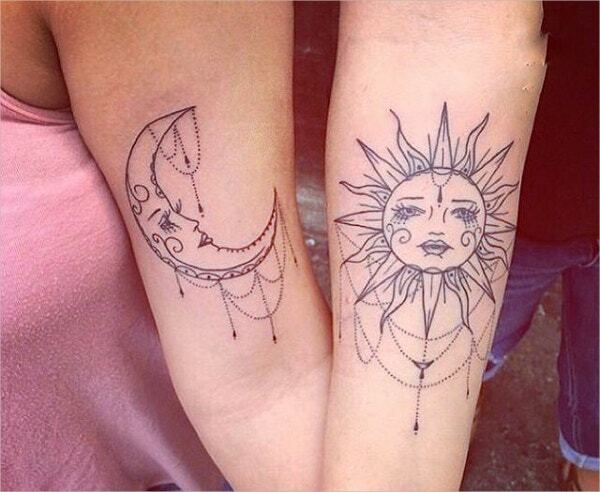 These are geometric tattoos of cartooned sun and moon on the two arms of a woman. The sun and moon images are beautified further with decorative hangings. This is a tattoo image on the entire back and one of the arms of a woman. 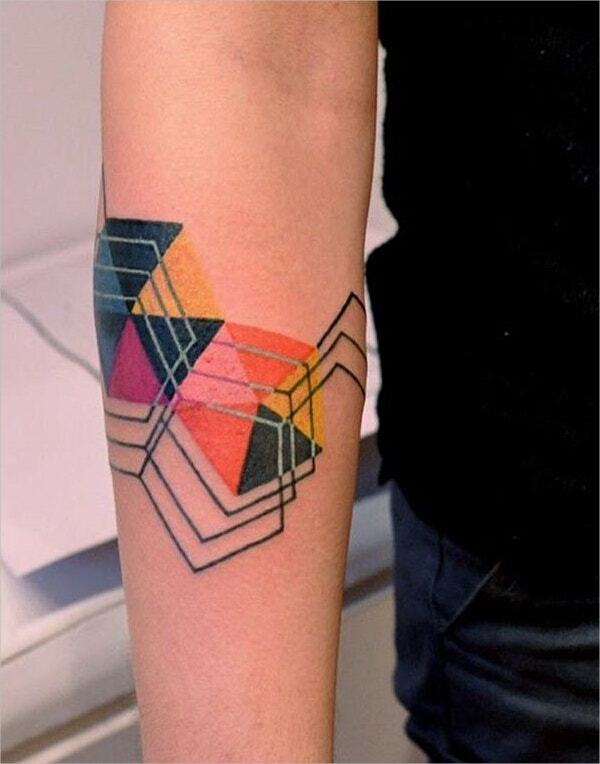 This unique and big geometric tattoo is in black and red. 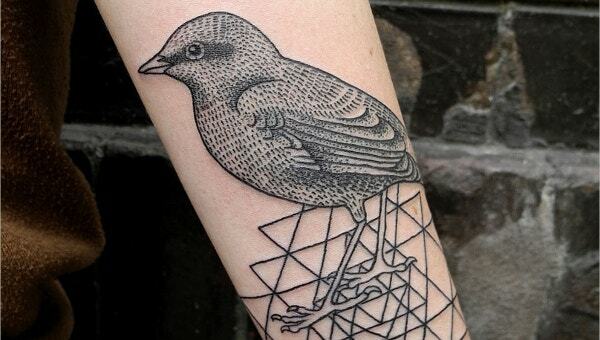 This is a minutely detailed tattoo drawing of a sparrow standing on a geometric pattern. It is present on the forearms of a fair woman. Tattoos are body arts that come in a plethora of designs, shapes, colors, and sizes. There are the realistic tattoo drawings, tribal tattoos, Abstract Tattoos Designs, non-conventional tattoos, fine art tattoo designs,zodiac tattoos, traditional tattoos, and many other types. Some of them are beautiful, some inspiration, and some sacred and beyond!